Mountains don’t stop at borders, but countries do and so do their respective car clubs. The quote above only hints at the complicated history of a world-class event held under different names and under the auspices of a multitude of countries and awarding buckets of prizes (all competitors who finished an event unpenalized received a trophy). 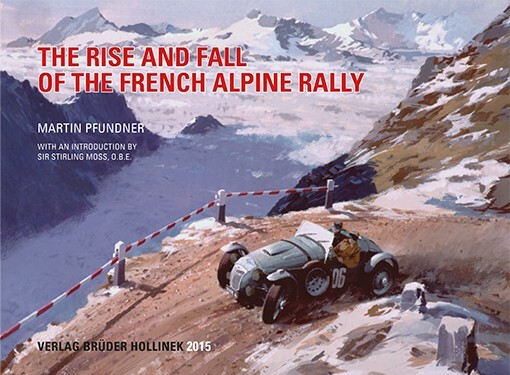 Author Pfundner has covered Alpine rallies before, not only in the form of books but as an actual, seven-time participant in the 1950s when it ranked among the most prestigious rallies in the world. Only one of his three books was in English, Alpine Trials & Rallies: Mountain Motor Sport 1910–1973, and it was short in order to fit the publisher’s requirements for their “Those were the days…” series (Veloce, 2005). Covering over a hundred rallies meant it only scratched the surface. That Pfundner is Austrian, as is the publisher of this latest book, seems only fitting as the idea of the Alpenfahrten originated in Austria. 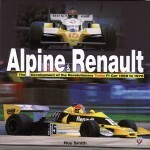 In addition to top-level positions with the Austrian branches of British Leyland and General Motors he has long-time involvement with professional motorsports, such as being race director at Zeltweg Airfield during its transition to hosting F1 championship racing, and serving at the CSI and FIA. 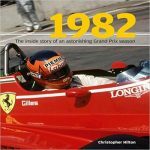 Having dealt with motorsports from all angles is probably why he emphasizes that this book is not a coffee table book but a documentary. And so it is, with a good third of it devoted to tables of race results and other minutia. As the book title implies, the rally no longer exists. Pfundner discusses the reasons behind mountain rallying as the ultimate endurance test for what were initially stock production cars, the history of early Alpines, explains why the French came late to the game, and then zeroes in on the French Period from the 1930s to ‘70s. This is Europe, so wars and political shenanigans play a major role but so do world events such as oil crises. Having morphed from endurance test into road race—on public roads and in ever more specialized cars—and often run at a financial loss to the organizers, the rally folded in the 1970s. It is notable that British teams and manufacturers embraced it, as they did other Continental motoring activities, in such a comprehensive way that most years British entries outnumbered all other nations. Divided into 10 chapters, highlights and particulars (regulations, handicaps, special stages, cars and drivers) of each rally are discussed one at a time. Precisely captioned photos, maps, elevation diagrams are plentiful if small, with only a handful availing themselves of the landscape format. The writing is lively (“The car caught on fire and so did the surrounding forest.”) but obviously has to embed a lot of facts into the flow of the narrative. Three-time winner (plus a Gold Cup since his wins were consecutive) Stirling Moss says in his nice Introduction that the Alpine Rally was the first and only motorsports event that so depleted him that he was brought to tears when the tension finally ebbed away. His sister Pat was a contestant as well and, in fact, the number of female participants is quite remarkable. Most of the photos are of cars at work, usually shot in curves which means drivers or suspension engineers can glean a lot of detail from really studying the photos! From bread-and butter DKWs and Saabs to rare Zagato-bodied Alfas and nowadays unaffordable exotica there is a lot of machinery to behold. To illustrate to what degree Pfundner attempts to help the reader relate, consider that one caption doesn’t just call out one Rolf Wütherich as co-driver but also says that it was he who rode in the car in which actor James Dean fatally crashed in 1955. 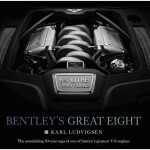 A closing chapter depicts—all in color—rally placards, car badges, programs, fine art, trophies. There’s even a Bibliography and an Index (people only)—leave it to the Austrians to do a most comprehensive job! Pfundner is now in his mid-eighties and there are many more motoring topics that would benefit from his ministrations. Here’s hoping! Thanks awfully for the glorious book review!